As a brewery grows and their capacity expands, eventually they are presented with the opportunity to begin or expand distribution outside of their home state. Unfortunately each state has their own series of regulations, laws, licensing and other bureaucratic BS, so it’s important for a brewery to be strategic in regards to when and how they grow. As more beers become available in a particular state competition heats up for shelf space and taps, so an incoming brewery probably won’t be able to showcase their entire lineup right away. I’ve noticed that many breweries have used their IPAs as an introductory beer to the Massachusetts market. While I would like to see a little more style variety, I understand why this is the case. IPA is the most popular craft beer style and introducing a new IPA to a market can help drive sales and boost name recognition. The first beer that prospective customers try is key, if they enjoy it they will probably check out other beers in the catalogue. 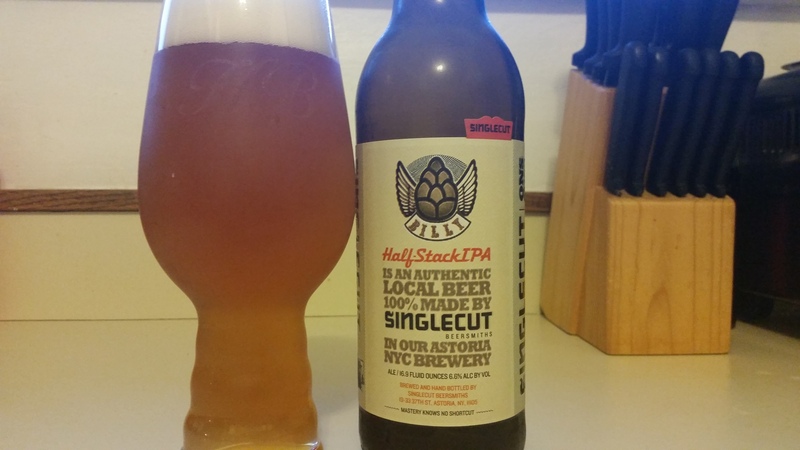 Singlecut Beersmiths out of Queens, NY recently started to distribute a few of their beers in the Boston area, and one of the beers they are leading with is Billy Half-Stack IPA. Singlecut Billy Half-Stack IPA is brewed with a blend of New World hops and is available year round on draft and in 16.9 oz. bottles. Previous PostBallast Point Grapefruit Sculpin Next PostIs it time to retire the term “craft beer”?